I had to pinch myself many times this week to make sure this is all real, as I feel like I’m in a dream. It is hard enough to get the opportunity to taste some of these wines back at home, but to be able to not only taste but also experience the wines one after another is amazing, and I feel truly blessed. The weather was gorgeous for my third day in this magical region, a clear blue sky greeted me and made the view from above Monforte d’Alba that much more spectacular. One of my realised dreams continues, as many of my wonderful hosts continue to introduce me to some of the regional cuisine. The previous day I enjoyed lunch with Giovanni from Massolino, where I had carne crudo (raw meat), which is simply minced beef with olive oil, garlic and pepper, and some freshly prepared ravioli with oil and thyme, and tagliatelle with a meat and tomato sauce. 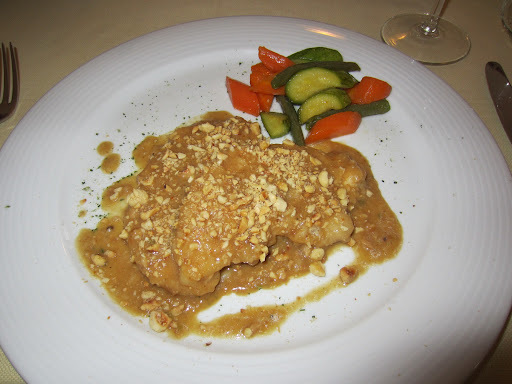 For lunch on this day I tried some thinly sliced cold cuts of beef with a mayonnaise, egg and tuna sauce, along with steamed turkey with a hazelnut sauce and steamed vegetables. My lovely host at the B&B invited me to enjoy dinner with them in the evening; chicken soup with rice, prosciutto crudo and roasted finnochio, and a castgna cake to finish. All washed down with some Moscato d’Asti. A gastronomical delight all around. 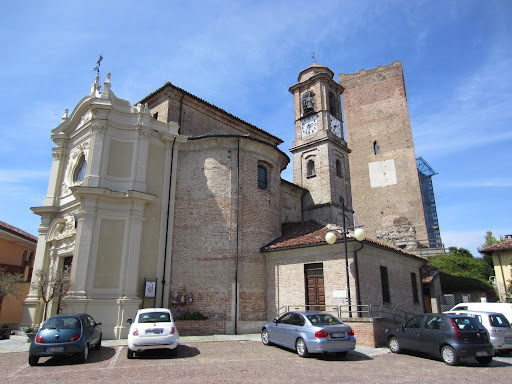 Day three began as mentioned up above a very historical part of Barolo; Monforte d’Alba. Conterno Fantino was created in 1982, which is not only the year of my birth, but is also one of the greatest vintages of the last century (coincidence, or fate?). 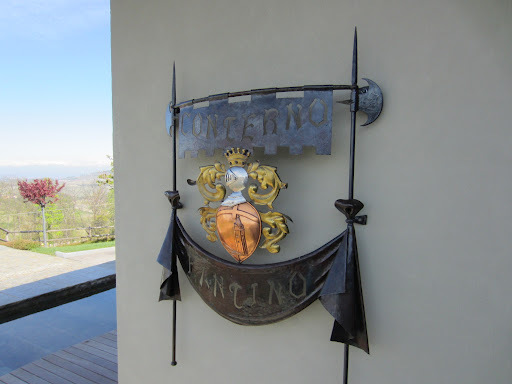 Perhaps it was fate for Guido Fantino and Claudio Conterno, as they have reached the pinnacles of Barolo to be one of the most sought after in the region. Whilst the 1982 vintage was a classic across most of Europe, Barolo included, the market for these wines was challenging to say the least, after the repercussions of a serious scandal in the 1970s. The cousins were determined to produce the best and most unique wines in the world, and to introduce the world to them. The hard work and perseverance of the modern pioneers of the region (many of whom I am lucky to be visiting), meant that now the name Barolo is well known from New York to Hong Kong. Step-by-step the winery has been expanded as the demand grew, and now the winery produces an exemplary range of wines using the dolcetto, barbera and nebbiolo grape, as well as chardonnay due to the families’ love of burgundy. One of the regrets of the business is that because of the need to make money to survive, entire vintages needed to be sold, and so there is only a very tiny amount of museum stock going back to the early eighties. Now the winery is able to set aside 500 bottles of each of the cru wines, in an effort to show how they develop and improve in bottle, something few have the chance to see. Second generation Fabio Fantino, who also comes from the 1982 vintage, has joined his father and uncle as a winemaker, and has travelled and worked extensively for someone of our age (if I weren’t making this trip I’d be even more envious). Fabio was another person I met in the ‘casino’ of Vinitaly what I looked forward to meeting in the region for a more relaxed tasting. The first exercise he took me through was to look at the nuances of the three cru they release separately, and to see the same winemaking influences from the same vintage. I then had the opportunity to look at another three vintages of the Vigna del Gris to see how the vintage influenced the same wine. Click here to read my notes from the tasting. Following the tasting I enjoyed a lovely lunch with Fabio, and he gave me one of the Barolo Boys football tops to take with me. Feeling that I was being quite Barolo heavy I was glad to have the opportunity to visit a producer in the heart of Barbaresco. 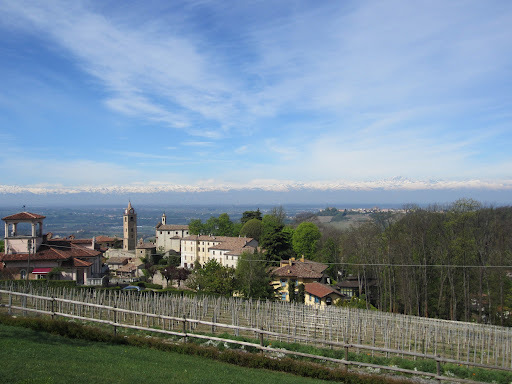 Whilst Barolo is a much larger area with 1,800 hectares under vine, Barbaresco is much smaller with only 600 hectares. This makes it the underdog, and I almost always support the underdog. Giuseppe Cortese is a winery that epitomises this ideal, producing wine from only eight hectares of vineyards. The winery is perched on the side of one of the best parts of Barbaresco in the Rabaja cru, providing not only exceptional exposition but also a lovely view that will soon be exploited on the new terrace. A very humble facility, the winery is simply designed to capture the essence of the variety in the specific site. The expansions in the winery are simply to allow them additional space to move, rather than to increase production. Maturation in small oak barrels is generally reserved for the Riserva Barbera d’Alba and Riserva Chardonnay, with the other wines seeing little to no oak maturation at all. Click here to read my notes from the tasting. My final visit for the day was to a piece of history in Piedmont, that has recently become part of the La Spinetta group. One of the oldest producers of sparkling wine in Italy, Contratto was founded in 1867 in Canelli, and over the last 140 years the winery went through many changes. Whilst initially making moscato sparkling wines, they began to make dry traditional method sparkling wines about 100 years ago. 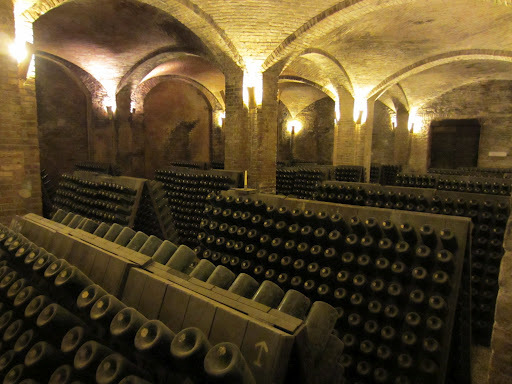 The cellars underground are extensive, and are arguably the finest in Italy, rivaling some of the cellars in Champagne. The Rivetti family of La Spinetta are going to return the winery to its former glory, but it will take time. If they can be as successful as they have been with their Spinetta brand, the sky is the limit. At the moment I don’t want to comment on the wines or the winemaking too much, as it will undoubtedly be going through a transitional evolution moving forward. Click here to see more photos from Day Three in Langhe, Italy.